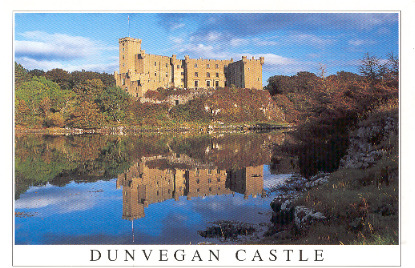 Dunvegan is Celtic for "Small Castle"
The name Dunvegan is Scottish Gaelic for "small castle" (dun bheagan). Dunvegan Castle has been the stronghold of the Chiefs of MacLeod for nearly 800 years and it remains their home. Built on a Rock once surrounded entirely by salt water, it is unique in Scotland as the only house of such antiquity to have retained its family and its roof throughout the centuries, surviving the extremes of feast and famine, the intermittent periods of warring with neighbouring clans, and the immense changes of social, political and economic life through which the Western Highlands and Islands have passed. Dunvegan castle, Scotland Dunvegan is a town on the Isle of Skye in Scotland. It is famous for Dunvegan Castle, seat of the chief of Clan MacLeod. Among all the historic houses of Scotland there is none that for sheer manifold fascination overtops Dunvegan Castle. It is at once the greatest and most renowned among Hebridean strongholds, and the only one which has been continuously owned and (with the exception of the eighty years after the Potato Famine of the last century) occupied by the same family, during a period now reaching back over a span of very nearly 8 centuries. Architecturally it is a structure of high importance, containing work of at least ten building periods. Its history, and that of the famous Clan whose Chiefs have ruled from their castled Rock during all these many generations, is rich with drama and packed with colourful interest. Within Dunvegan's stately halls are priceless heirlooms, some of which have descended in the hands of the Chiefs of MacLeod since medieval times. The picturesque quality of the building itself is matched by its glorious surroundings. "Ane starke strengthe biggit upon ane craig", so it is described by a writer of 1549; and so it still remains. Rising sheer from the almost perpendicular edges of the rock, its massive grey towers and hoary battlements stand forth against an unrivalled background of sky and mountain and islet-spangled sea. On the landward side the castle - no longer girt by the bare wine-dark moorland, as when Dr Johnson visited it in 1773 - is now sheltered by extensive and thriving plantations, through which re-echoes the ceaseless murmur or"Rory Mor's Nurse" - that 'torrent's roaring might" celebrated by Sir Walter Scott in the Lord of the Isles. Around those waterfalls are being reclaimed today the gardens of the castle, whose beauty and range of plant life have already attracted the interest of serious gardeners from all over the world.